I am so grateful for ...you! Hehehe! I picture my family dressed up like that for our Thanksgiving feast! Too funny! I hope you all have a blissful day full of those things that you are most thankful for! I will be spending my day with my beautiful family and then I'm being wisked away for a petite vacation with my husband. My first time away from my little boy overnight! I'm a stress case right now! So for now this is all, I will be back hopefully Sunday evening if not then for sure on Monday. Many warm wishes to you & your family! Thank you to all of you who stop in & to the many, many new friends I have made in this incredible blogging world. You inspire me & provide me with so much delicious eye candy & new insights! Would Anybody Care to Skip Stones With Me? The Canal St.Martin has always been a favorite haunt of mine. A lovely place to take a book & catch some alone time or meet up the gals & catch up! 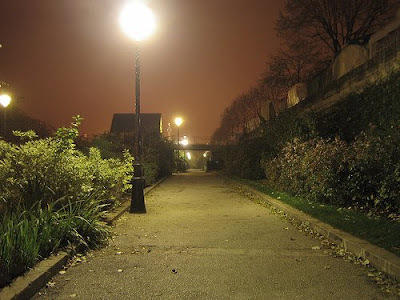 It stretches from the Square Frédérick Lemaître to the Rue Lafayette and shortcuts a long loop in the River Seine in the 10th arrondissement. Napoleon had ordered the artificial waterway dug to supply Paris with water. The canal was opened in 1825, however by the 1960s, traffic had dwindled and fortunately the canal escaped being filled in and paved over for a highway. 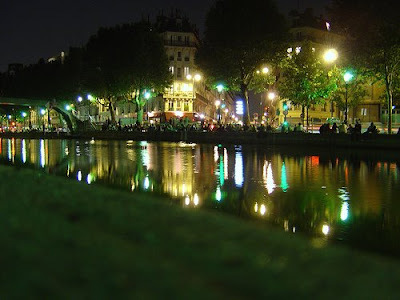 Today, the canal is covered from Rue du Faubourg du Temple to the Place de la Bastille. 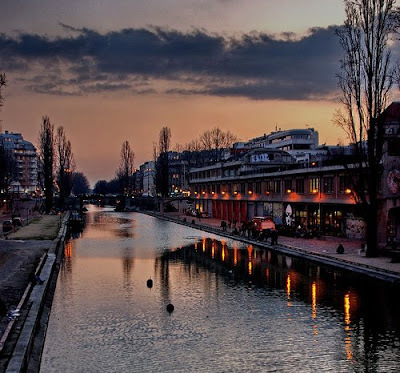 The canal is featured in the 1938 movie Hôtel du Nord, as well as one of my all time favorite movies, the 2001 movie Amélie, in which Amélie Poulain enjoys skipping stones at the locks of the canal. 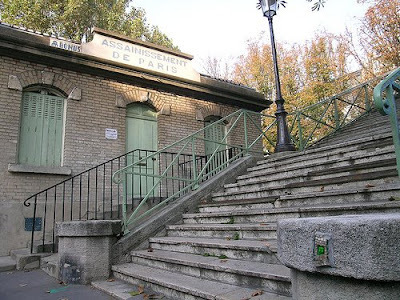 In the spring and summer, locals flock to the banks of the Canal Saint-Martin to picnic and strum guitars. Cafés and quirky boutiques flank the water and iron footbridges. 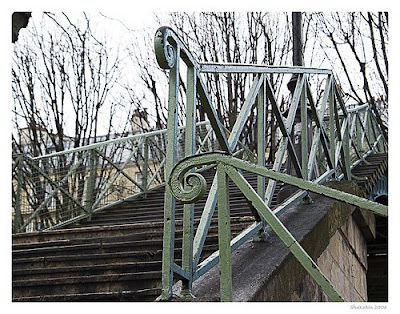 On Sundays, two streets running parallel to the canal, Quai de Valmy and Quai de Jemmapes, are reserved for pedestrians and cyclists—perfect for renting a bike and seeing the city from a fresh angle. Another possibility is to take a tour of the canal by boat. The canal and its surroundings were entirely reconstructed on set for Marcel Carné's 1938 film, Hôtel du Nord. 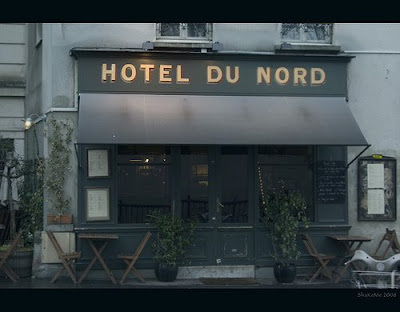 Originally built in 1885 as a hotel serving mostly manual laborers, the Hôtel du Nord is now a bar and restaurant. A zinc bar, velvet curtains, low lamplight, and an upstairs library give the former hotel a distinctly 1930’s charm. It's just delicious! 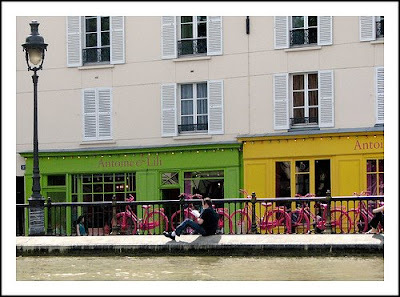 Antoine et Lili is unmistakably the place alongside the Canal. It is a quirky fashion boutique whose bright yellow and pink facade is now an icon. Don't miss it for the latest in urban fashion and "ethnic" clothing. The "village" also includes a restaurant, bakery, and tearoom. It is defiantly a place to visit and take some photos. 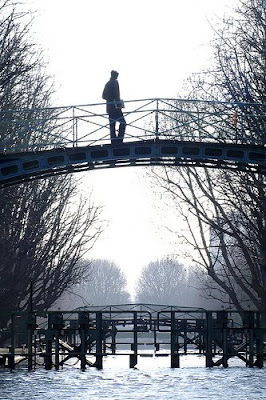 If you look into the distance in the photo you can catch a glimpse of the Bastille angel. There is much to see & do in this area if yo so choose. 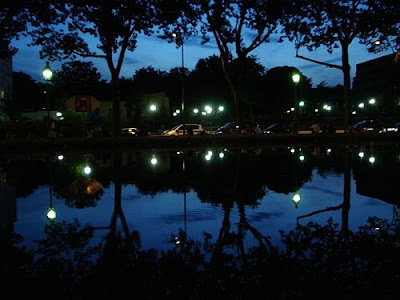 Along the Promenade Canal St. Martin one can enjoy a stroll along the water's edge while viewing amazing sunset's over the canal or linger over a coffee and a pastry while feeling that you are experiencing the true Paris. There is also the Musee de l'Eventail which exhibits a collection of more than 400 fans from the 18th century to the present day. A lot of eye candy there! Also check out the Palais des Glaces (Palace of Mirrors) features two comedic shows. the Indian shops in le Passage Brady, which is a slightly dilapidated passageway. It's full of Indian and Pakistani restaurants, which gives it the nickname Little Bombay. My personal favorite, however, would have to be the Marché St-Quentin it offers a variety of goods from flowers and produce to antiques and candies. 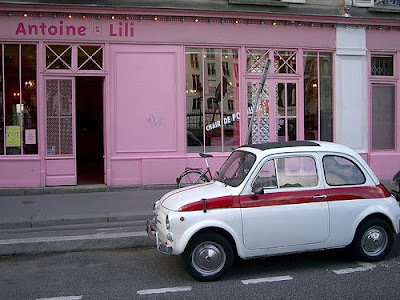 On the Rue de Marseille, you will find many chic clothing boutiques, and you’ll also find Du Pain et des Idées, one of the best bakeries in Paris. I personally find it most beautiful in the Winter when the snow has fallen & the children are bundled up playing. It is beautiful all year round though. 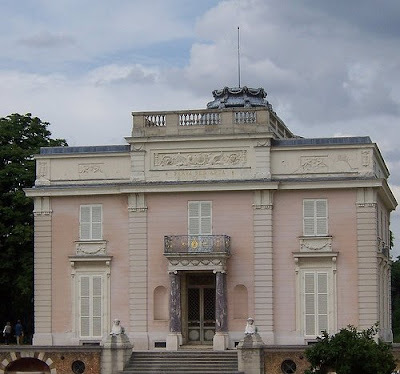 It was on one lazy afternoon with his close friend and sister~in~law, Marie Antoinette, that The Count of Artois, brother of Louis XVI, proposed to build a folie (a bit of crazy, a flight of fancy) of grand proportions in three months. "I dare you!" 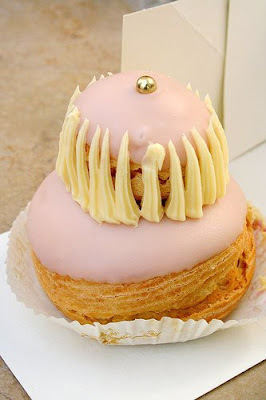 retorted Marie Antoinette. "Bagatelle!" pronounced the Count (Bagatelle means a mere trifle). That, my friends is how this jewel of a garden was born! Thank goodness for the whims of the rich & idle! 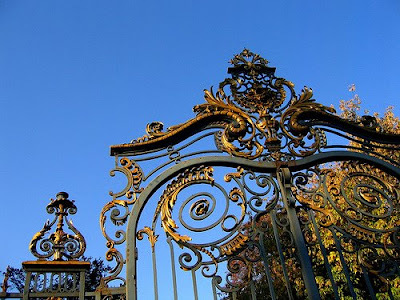 In the XVIth arrondissement of Paris, we discover the glorious Jardin de Bagatelle. In 1775 the Count put over 900 men to work on this giant feat in order to win his bet! The men worked day & night tirelessly for 63 days! Can you imagine that this was done in only 63 days! Amazing. This garden (or rather, gardens) is absolutely incredible, I happened to be there in the summer of 2000 when they had a hysterical , exhibit which was rumoured to have been put on by the "Garden Dwarf Liberation Front." 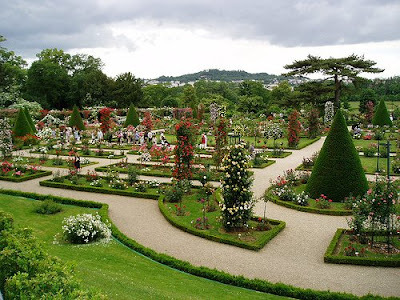 This group "liberated" garden dwarves from all over France and set them free to roam in the Jardin de Bagatelle. Those little guys were everywhere! 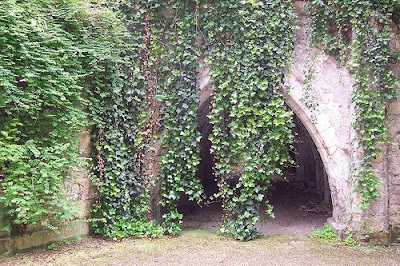 In the woods, in boats, emerging out of the ground like gophers, they had taken over the château and the grounds , there were a series of identical silver-plated dwarves arrayed in the formal garden keeping with the spirit of the garden around the round pool. Dwarves were peeping from every château window! Funny! 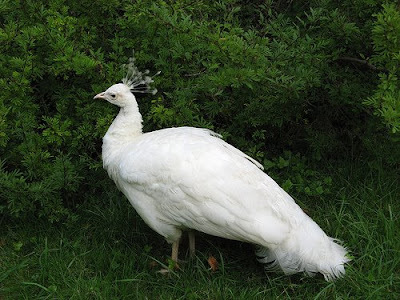 As are their very colorful counterparts! 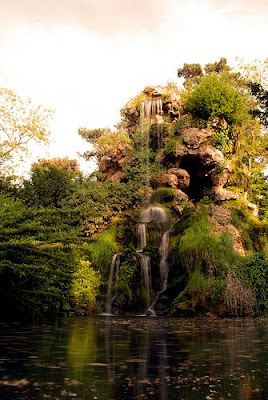 I recommend taking a stroll though the park to admire the artificial rocks, the cascades, the little bridges over mirrors of water, the centuries-old trees, and especially the jewel of the Jardin de Bagatelle, the magnificent rose garden, containing over 1,100 varieties of roses. Every year since 1907, the famous New Roses competition has taken place in this rose garden. 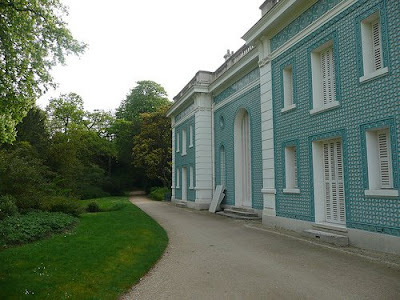 The Jardin de Bagatelle consists of a landscaped park and a large number of small themed gardens, the Nymphéas pool, the iris garden, the garden of hardy plants and even has a bit of country nested in this royal playground in the form of a wonderful potager, or kitchen garden. This instructional yet beautiful garden represents the spirit of the French potager, which is beautiful and also full of wonderful things to eat. 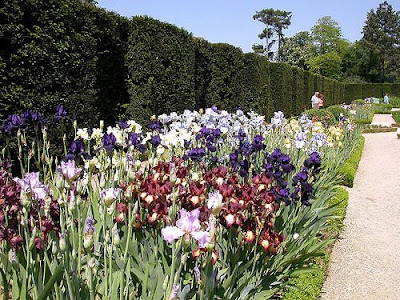 Claude Monet is said to have cherished these gardens and spent a great deal of time here. 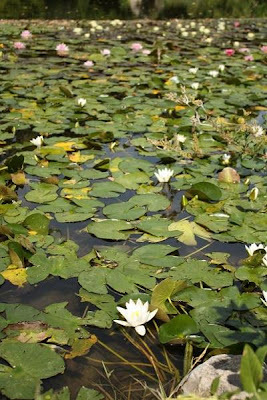 There is a Water~Lily pond that he loved and also painted. A beautiful spot indeed. 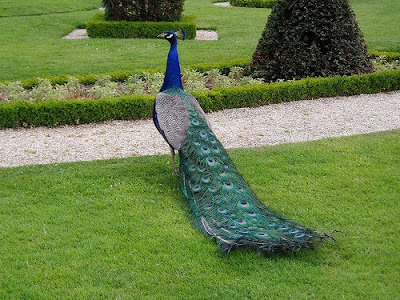 One could get lost in time wandering through these lush and glorious gardens as well as the Chateau itself which offers a unique example of Roccoco architecture and 18th century decor. The chateau also houses a bed & breakfast for anybody wanting to stay a little longer. It has two suites and I hear they are charming. 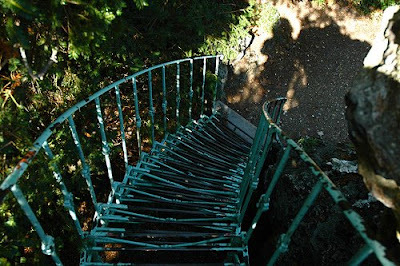 At the top of this staircase is the most wonderful little pagoda~like, gazebo~esque structure, which I could not find any pictures of. It is simply gorgeous! 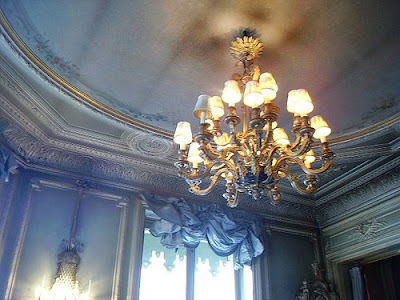 It has a lovely Asian feel to it with Gold leafing and designs with shades of Green/Blue on the underside of the roof. A beautiful place to take photos (ironic that I don't have one)! A truly magical place to visit! During the Spring months many outdoor concerts and exhibitions are held here. 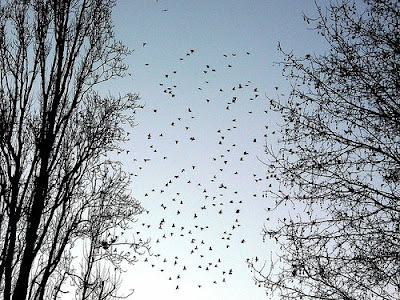 A must for any nature lover. 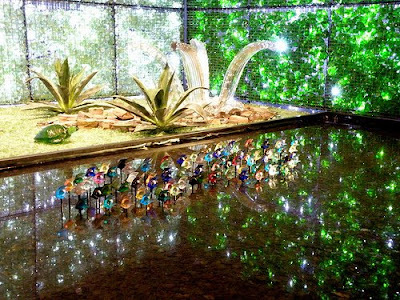 Since I am a sucker for anything shiny, I had to include this dazzling exhibit. 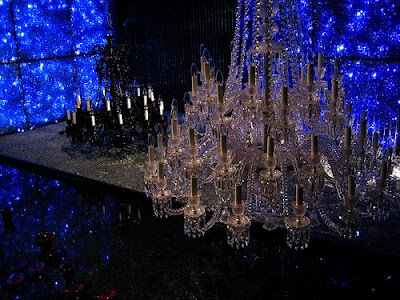 The four most prestigious French crystal houses Baccarat, Daum, and Lalique have graced the gardens with chandeliers hanging from the trees, delicate sculptures decorating the fountains, stunning crystals at every turn, crystal swans swimming gracefully in the ponds, and sheets of diamond like crystal shimmering in the sun. As Winter is creeping up on us & there is a chill in the air, I sit here remembering the warm days (no, strike that the sizzling days) in Paris. 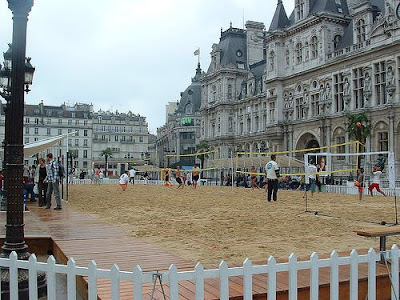 Beach volleyball in front of the Hotel de Ville ~ Incredible! 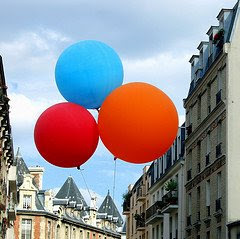 The summer transforms Paris! The cityscape dons Palm trees (In a very French fashion, potted & expertly placed in a neat row) and the riverside thoroughfares become car-free resorts. 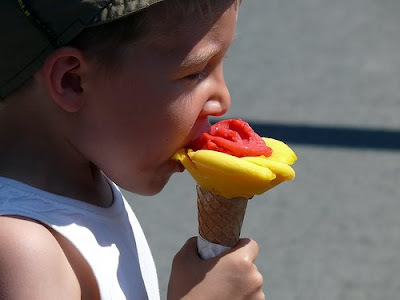 Even the ice cream looks heavenly! 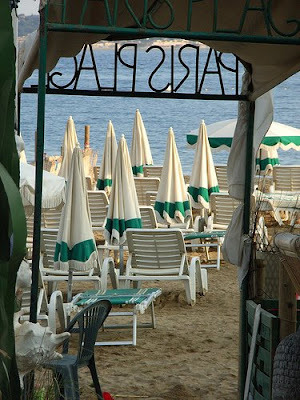 The Paris Plages (Paris Beaches) operation kicks off on or around 20 July and lasts four weeks. It began in 2002. 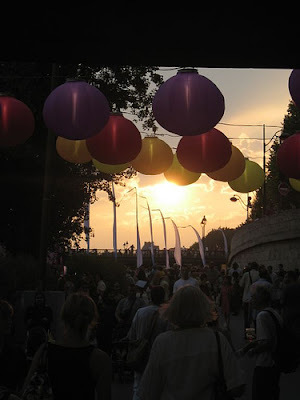 A Seine-side holiday is what Paris Plages is all about ~ complete with sandy beaches, deckchairs, ubiquitous ice cream sellers, and concerts for French and foreign guests. 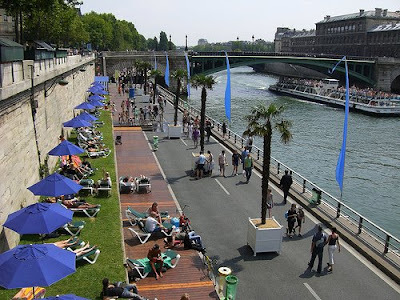 Holidaymakers at the Bassin de la Villette (Paris 19) can also borrow books free of charge, play beach volley, take an aquagym class in a mini pool, or kayak around the lake – or, of course just relax and enjoy. 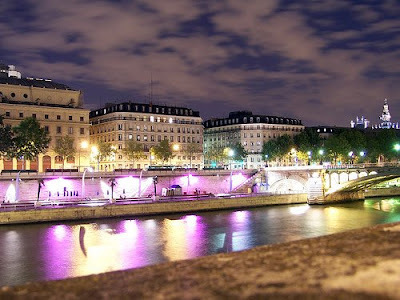 The Seine’s banks become pedestrian and the beaches are spread across three spots (Louvre/Pont de Sully, Port de la Gare and Bassin de la Villette). 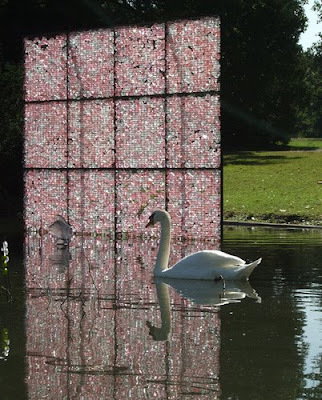 The project attracted more than 3 million visitors last year & is such a fun way to spend your time. There really is something for every taste. The floating swimming pool is a great place to spend an afternoon. 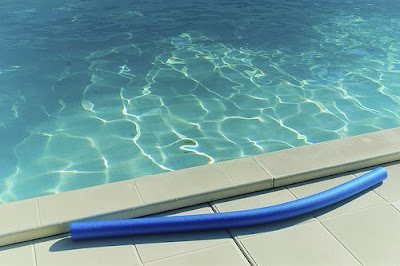 They have aqua aerobics and fun activities for the children. There are life guards on duty as well. It is generally open from about 8am nonstop until midnight! There is entertainment for everybody! Live musical performances, street performers, everything! It's such a pleasant & easy way to spend all day fighting the heat. My favorite part of Paris Plage, however, is the fantastic people you get to meet! We made so many new friends and met up with our old friends too! You can't beat friends, palm trees, colorful parasols, bathing suits, & ice~cream! The lights at night are truly magical! So, the next time you are in this gorgeous city when it sizzles! 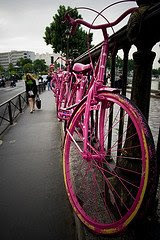 Try to check the Paris Plage out! So fun! 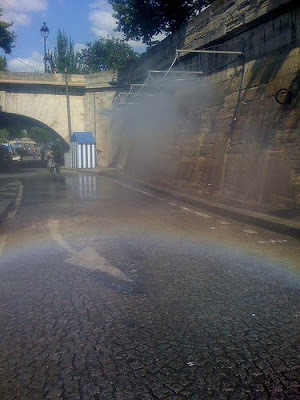 If you get too hot you can run through the misters! 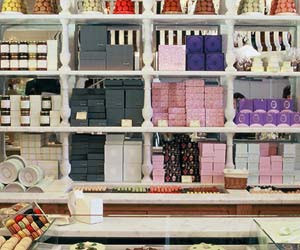 In case you have never heard of Laduree it is a luxury pastry brand based out of Paris, France. It is divine! I am lucky there is not one here or I would be as big as a house! 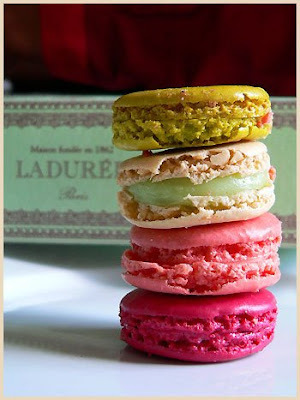 Laduree is probably most famous for it's double decker macarons and I read that they sell over 15,000 of them worldwide per day! WOW! 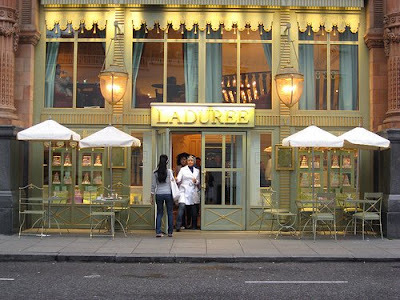 Louis-Ernest Ladurée, founded the bakery on the Rue Royale, in 1862. After burning down in a fire in 1871 a new pastry shop was built at the same location. 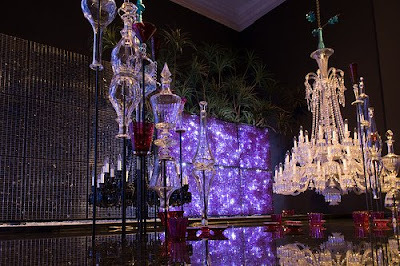 Jules Chéret was the interior decorator we can thank for the incredible interiors. The chubby cherubs dressed as pastry cooks, painted by him on the ceiling, form the company's emblem. 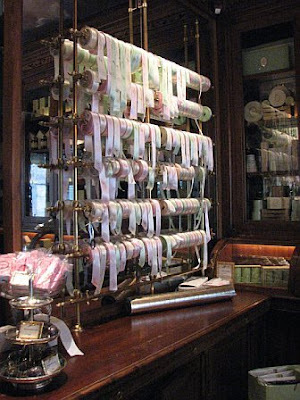 The interior of the bakery was then painted in the same Celadon Green color as the façade (way before Martha called it her own)! 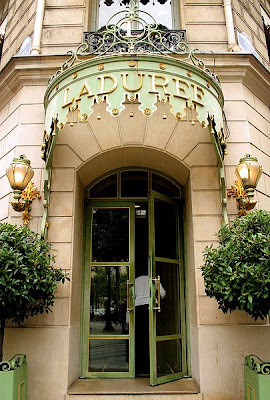 Ladurée's rise to fame came in 1930 when Pierre Desfontaines, had the idea of the double-decker, sticking two macaron shells together with a creamy ganache as filling. Queen Catherine de' Medici had brought the macaron to France from Italy in the 16th century (My goodness this woman did a lot of things!) , and the recipe for the biscuit had hardly varied over the years. Desfontaines also opened a tearoom at the pastry shop. 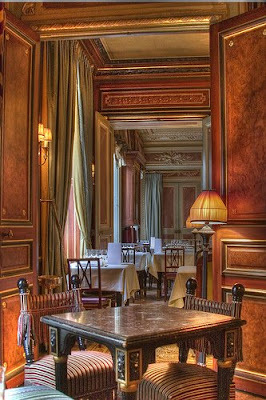 Back in those days the ladies were not admitted into cafés, which were the exclusive domain of men (could you imagine). This was a big success with ladies, who enjoyed meeting in the freedom of the tearoom rather than their homes and in such a setting. 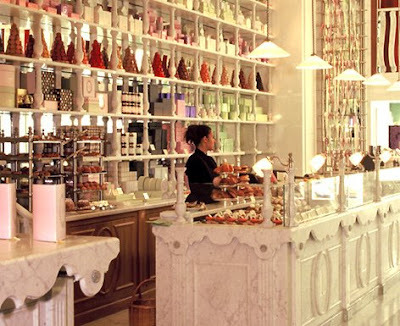 Laduree is famous not just for their macarons but for their other equally impressive pastries. There are so many and they are so delicious! 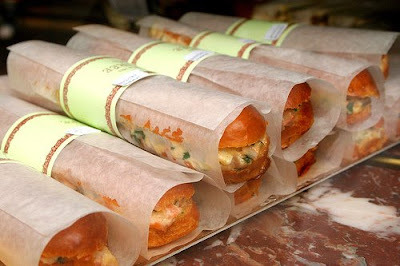 One can also get sandwiches, omelettes, salads, cafe, tea, and so much more there. 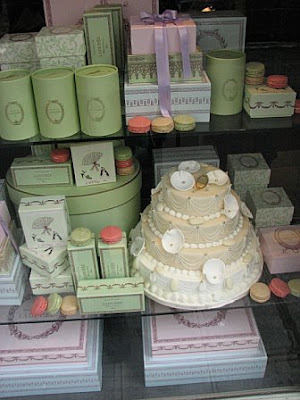 Upon seeing one of their wedding cakes, I vowed to renew my vows with my husband one day in the Collinade in Versailles garden's with a Laduree cake! I was only able to visit the Champs Elysees but I am a devoted fan! And, for all of you fans out there...I hear they are coming to the States soon. OK, I do not cook, as you might know, however, I did find this recipe for all of you having macaron withdrawls! Who knows, it might be fun! ~With a wooden spatula, stir downward toward the middle of the mixture and back up the sides of the again, constantly turning the bowl, until the mixture is even, light and fluid. the small macarons on wax paper. ~remove from the oven and with the aide of a glass, slip some water between the wax paper and the baking sheet while gently lifting off the macarons. The water vapor will allow them to release from the paper when they cool. ~Pour the creme over the finely chopped bitter chocolate. Add butter at a temp of at least 60 degrees C (104F). Let sit and cool to ambient temperature. The original doesn't say to mix, but I'm assuming you need to blend to make the ganache. 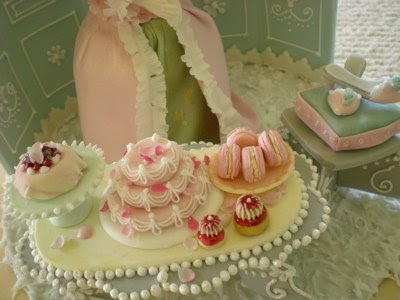 ~Garnish the macaron shells with a layer of ganache about 3/4 millimeters thick and sandwich the two halves together. ~Advice: Let the macarons chill in the refrigerator for 24 hours before eating (if you have the will, it is REALLY worth it! )This recipe is really delicate, but incredibly delicious! 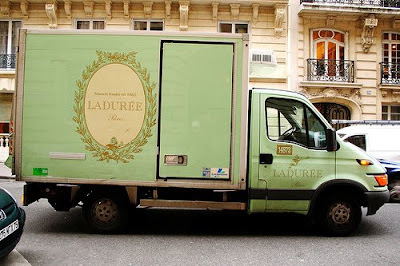 I wonder if they'll deliver to my home!?! Les parfums permanents : Chocolat - Chocolat amer - Vanille - Café - Pétales de Rose - Pistache - Framboise - Cassis violette - Caramel au beurre salé - Griottes - Fleur d’Oranger - Réglisse. Les parfums d'été :Noix de coco - Menthe Glaciale - Grenadine. Don't forget that every season there is a new flavor macaron! I wonder if my husband will buy that as a reason to go more often!? !